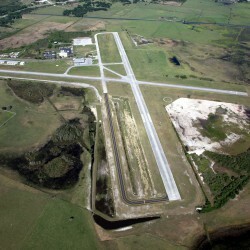 Hoyle, Tanner is proud to announce our selection by the City of Lake Wales, Florida, for the Runway 6-24 Rehabilitation and Extension project at Lake Wales Municipal Airport. As the City embarks on this runway construction project, Hoyle, Tanner is excited to continue providing construction management services after 13 years of successful relations with the City. The City has identified Runway 6-24 improvements to be high priority. The goal is to construct a 1,401 linear foot extension of Taxiway Alpha, construct a 1,401 linear foot extension of Runway 6-24, and include all associated lighting, signage, and striping. Due to the existing Runway 6-24 pavement deterioration, Hoyle, Tanner will rehabilitate both the pavement and the pavement markings to better ensure aircraft operation safety. As the City has retained Hoyle, Tanner as an on-call consultant, we are already familiar with the project specifications. Before construction could begin, our team prepared an environmental assessment and permit package, as well as evaluated the stormwater impact of the project. Hoyle, Tanner and our qualified aviation team eagerly anticipates working with the City of Lake Wales on this important runway rehabilitation and extension.